Energy Sec. Rene Almendras said that consumers should pay part of the enormous P932.21 billion in debts incurred by the energy sector. The rest will be shouldered by government, said Almendras, because they are not allowed to recover the entire P932.21 billion through the universal charge. Government, of course, will use taxpayers’ money and taxpayers are also the consumers of electricity. Before EPIRA was passed in 2001, the debt of NAPOCOR was pegged at $16.5 billion or about P729.14 billion (based on an exchange rate of P44.19 per US dollar, the 2000 average according to central bank data). Proponents of power privatization made the public believe that such heavy debt burden can be reduced by EPIRA. Economic managers of the Arroyo administration, for instance, claimed that the privatization of NAPOCOR will yield a surplus of some P22.29 billion in consolidated public sector deficit (CPSD) by 2009. CPSD includes the budget deficit of the national government and its monitored government-owned and –controlled corporations (GOCCs) and reflects the public sector’s financial position. But instead of a reduced debt, Filipino taxpayers and consumers are now confronted with a power debt that is more than P203 billion larger than before state-owned power plants and transmission assets were sold to the biggest local compradors and foreign companies. The CPSD for 2010, meanwhile, is expected to hit P281.3 billion. Government ended up more indebted and bankrupt, while the people oppressed thrice over – by servicing the debt through taxes, by enduring lack of social services as funds are siphoned off by debt servicing, and by paying exorbitant monthly electricity bills to cover among others payment for NAPOCOR debts. This is the cost of the privatization of state assets that we have been paying for in the name of so-called fiscal consolidation, which by the way is the favorite buzzword today of the International Monetary Fund (IMF) and the World Bank, and unsurprisingly being echoed by Aquino’s finance officials. President Noynoy Aquino also made it clear that privatization, including through public-private partnership (PPP), will be among the main pillars of his medium-term economic program. As mentioned, bulk of the power sector’s debt, P785.09 billion, represents PSALM obligations, which it absorbed from NAPOCOR under EPIRA. Specifically, these are called stranded debts and stranded contract costs. Stranded debts refer to any unpaid financial obligations of NAPOCOR which have not been liquidated by the proceeds from the sale and privatization of its assets. Stranded contract costs refer to the excess of the contracted cost of electricity under contracts entered into by NAPOCOR with independent power producers (IPPs) as of Dec. 31, 2000 over the actual selling price of the contracted energy output of such contracts in the market. As mandated by EPIRA, these costs shall be passed on to hapless consumers through the universal charge. 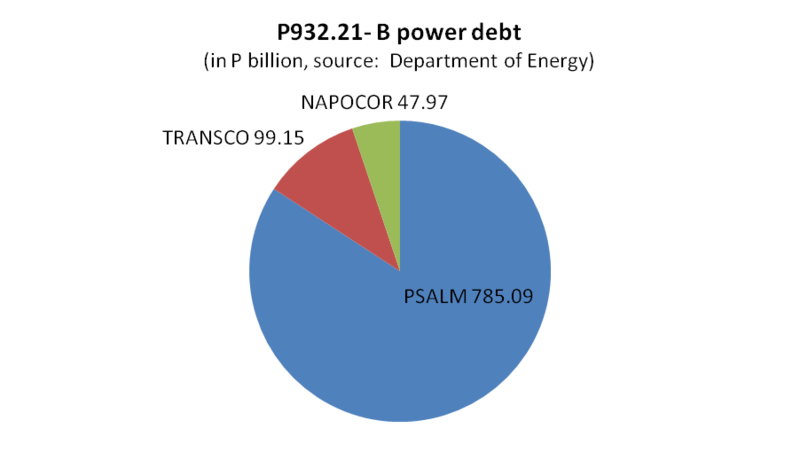 Of the P785.09 billion debt of PSALM, stranded debts account for about P525.76 billion. PSALM has already filed two separate petitions in 2009 and this year before the Energy Regulatory Commission (ERC) to recover the amount through a total rate hike of P1.17 per kilowatt-hour (kWh). Meanwhile, PSALM’s stranded contract costs recovery, if approved by the ERC, will result in a rate hike of 69.03 centavos per kWh. Total rate hike due to stranded costs recovery thus could reach P1.86 per kWh that shall be reflected in the universal charge. But how and why did the debts of NAPOCOR/PSALM increase? Ideally, the debt of NAPOCOR should have been settled by the proceeds from the privatization of its power generation plants and other assets. This, however, did not happen as the sale of power plants has been greatly delayed and investor appetite hampered by among others lack of guaranteed markets through supply contracts and irregularities in the bidding process. Consequently, government has been forced to continue maintaining the unsold power plants and in the process incurred more debts. EPIRA has only surpassed the 70-percent mark in privatized assets and contracted capacities early this year, and even this is still unofficial since the accomplishment counts Angat dam that is currently under question before the Supreme Court (SC). So far, PSALM has clinched privatization deals worth a total of $6.7 billion ($3.47 billion for power plants and $3.23 billion for contracted capacities) while the privatization of TRANSCO yielded $3.9 billion. But the privatization revenues as well as income from remaining power plants are not enough to cover the financial obligations of PSALM to creditors as well as to NAPOCOR’s old IPP contracts. In 2009, for instance, debt service maturities and obligations to IPPs reached $2.45 billion (about P116.72 billion, based on the 2009 average exchange rate), dwarfing the P10-billion income PSALM generated from the still unprivatized power plants during the same period. Furthermore, we have also learned recently that PSALM has incurred “privatization-related expenses” that it integrated in its calculation of recoverable stranded costs. These include a privatization bonus for PSALM officials and employees amounting to P80.9 million as well as privatization consultancy fees worth P118 million. In a 2002 review IPP contracts, an interagency committee found out that at least 26 contracts are fraught with financial issues, meaning they contain provisions (take or pay, fuel cost guarantee, etc) that are financially disadvantageous and burdensome for government. The then Arroyo administration set up the IPP review body amid strong public protest against exorbitant electricity rates. The table below lists these financially onerous IPP contracts. Unfortunately, government did not rescind these contracts after warnings from the foreign creditors and power firms that doing so would undermine investor confidence in the country. Today, these debts are approaching the P1-trillion mark and the Aquino administration wants us – as consumers and taxpayers – to shoulder the burden. We should not honor these illegitimate debts. We should not allow PSALM to further hike power rates in order to recover NAPOCOR’s stranded costs through the universal charge. NAPOCOR’s debts should at least be renegotiated with creditors and the 2002 review of IPP contracts must be revisited in order to find ways to substantially reduce the debt burden. EPIRA must be finally repealed to stop the power sector’s financial bleeding. The vicious cycle of privatization, debt, and exorbitant electricity rates must be stopped from further oppressing the people, especially the poor. Unfortunately, the policy direction of President Aquino points to more privatization, more debt, and more exorbitant electricity rates. → Noynoy’s US visit: RP to get more counterinsurgency aid via Millennium Challenge Corp.